All-in-one media player to watch HD movies on Windows For a Home Theater Experience! The best reviewed Blu-Ray playing software for Windows in the world. Provides extremely superb experience for Blu-ray, DVD and HD movie playback with full Blu-ray and HD movie playback navigation. Multiple languages supported and 100% compatible with Windows 10. 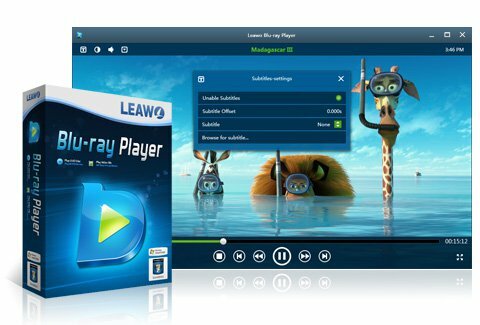 This Windows Blu-ray player software is the best software to quality-losslessly play back Blu-ray movies on Windows, including Windows 8.1/8/7/XP/Vista. As professional Blu-ray media player software, it can play back all Blu-ray discs in the market, Blu-ray folders and Blu-ray ISO files. Enjoy full play back of common videos in AVI, MPEG, WMV, MP4, FLV, RMVB, MOV, Xvid, 3GP, etc. and up to 1080P HD videos in HD MP4, HD AVI, HD MOV, HD TS, HD TRP, HD VOB, HD MPG, HD WMV, HD ASF, etc. Nice audio player to enjoy songs! Blu-ray Player can play back audio files with visualized interface for better music enjoying, in AAC, AC3, MP3, M4A, MKA, WAV, WMA, etc. Within Blu-Ray Player, subtitles and audio tracks could be selected during playback. People could enjoy Blu-ray discs, DVD discs, common videos and HD videos in preferred subtitles and audio tracks for better enjoyment. As known to all, DTS5.1 can guarantee super high quality of stereo audio output. 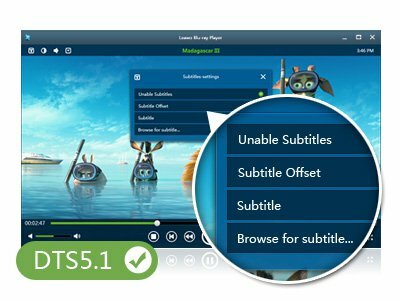 At present, Blu-ray Player can support DTS5.1 in v1.9.5 and its upper versions. Besides DTS audio decoding technology, Blu Ray Player also supports Dolby, AAC, TrueHD, DTSHD, and other advanced audio decoding technologies for better movie experience. This Blu-Ray playback software provides full navigation for Blu-ray, DVD and video playback. It provides 2 different techniques for users to open source videos and Blu Ray/DVD discs respectively. For Blu-Ray/DVD disc playback, this Blu-ray media player provides full menu of the source discs for users to play the main movie, select scenes, play bonus features of the movie, etc. 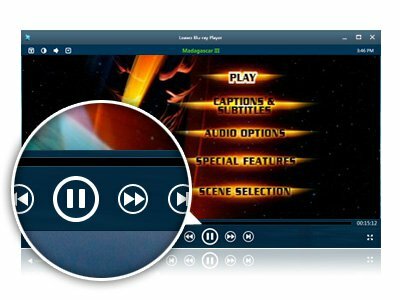 Blu-Ray media player produces quite excellent user-friendly control for media playback experience: full-screen playback, volume control, fast-forward button, fast-backward button, Next button, Last button, Subtitle selecting button, Video setting, Audio setting, Main menu button and Clock Display. 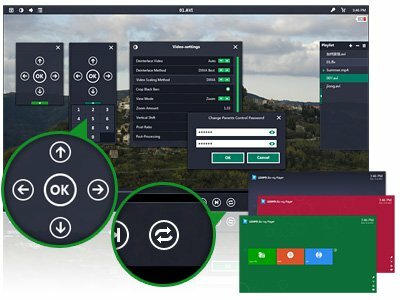 Blu-Ray Player supports virtual remote control of Blu-ray/DVD disc menu to let users select disc menu during Blu-ray/DVD disc playback. Users could select what to play via virtual remote control. Blu-Ray Player allows users to load multiple files to the playlist for playback. Various playback modes are supported for multiple files, including: Order, Loop and Shuffle. Blu-Ray Player enables users to switch program skins between 4 preset models and custom background picture by setting local image files as background picture.